These photos are a little more extensive shots of the Site and interior of the WWOD studios. It is truely amazing what was left behind when they close this station down for good. Thes photos were taken by DJ Mad Lad and I owe many thanks to him for getting inside the building and taking time to share these photos with us. His web site is www.djmadlad.com DJ was old a pirate radio operator in Lynchburg when he was school age. He has photos on his site of the studios. Dj Mad Lad also informed me the old WWOD 1390 KHZ AM frequency is used by Dave Morans WKBA/WKPA Southern Gospel as a simulcast in Roanoke. It now uses one tower location in Madison Hgts. The old WWOD 100.1 MHZ FM frequency is now Urban WVBE, owned by Mel Wheeler(K92-Roanoke). 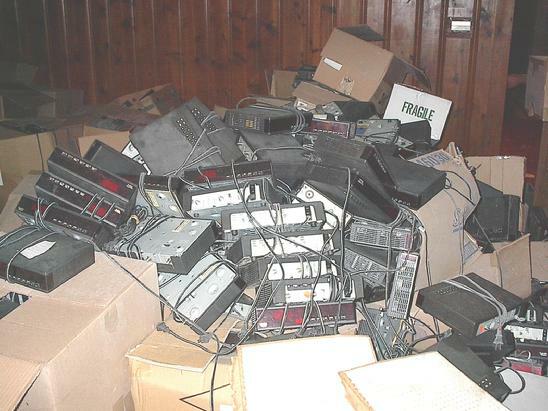 "I remember the WWOD, 78 record library and other radio equipment that might still be there. That is when I looked up the present owners to see if I could get in the building. Also I met this guy who had a tv-Starz network show about collecting old 78's, and I thought that I could help him out with WWOD's library(My site, click on celebrities, Joe Buzzard)! No such luck, they were donated to Jerry Falwells school long ago. Nothing in there was worth getting, I took those pictures in the dark, with a flashlight, aiming at what I thought was something interesting!" Thanks again to DJ Mad Lad for these interesting 2007 photos of the WWOD remains. I guess its time for cremation. 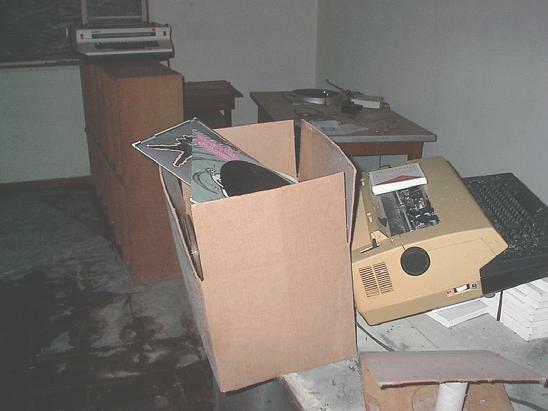 WWOD - 2007 - This is was is left of the AM control Room studio. To the left rear, you see the door to the FM studio. Just to the right of the door is te window that looked down to the FM studio and to the right of that, you see part of the window that looked into the production room. WWOD 2007 - Unbelievable!! The AM transmitter is still there with turn on and turn off instructions. WHAT WOULD SAM RAYBURNE SAY?? That may still be his writing on the turn on and off instructions. WWOD 2007 - This is taken in the AM contrl room studio just in front of the door that led to the FM studio. It appear to be the reamins of an old automation system rack. WWOD 2007 - This may be the remains of the FM studio. WWOD 2007 - This looks like it was use for the production room. I am not sure, because the control board looks a little newer than the one used in 1973. WWOD 2007 - Another shot of the area I suspect was used for production. I can't believe all this stuff is still located in the building after all these years. I would love to buy a couple of pieces from the current owner just for the memories. 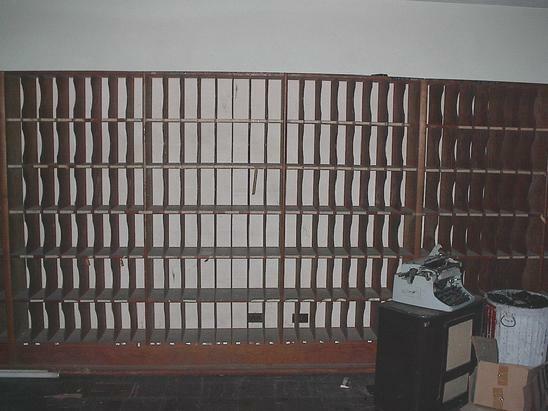 WWOD 2007 - Shot of wall rack in Record Library. There were a lot of top 40 oldies and even 78's in this large room. Unfortunately, this shot does not show you how big the room was. By the way, I think that typewriter is left over from my 1973 days at OD Radio. WWOD 2007 - Shot of one of the offices. at the top left you can see a portn of the boarded up window. I do not remember this typewriter. It looks like there is a reel to reel tape in the box. I wonder was was recorded on it?